Duncan McNicholl came to Cambridge in 2014 when he was awarded a Cambridge International Scholarship to undertake a PhD in Engineering at the Centre for Sustainable Development. Duncan is passionate about access to safe water. Originally from Vancouver, Canada, Duncan began his education in civil engineering when he thought to design water pumps to send to Africa. His perspectives changed through his involvement with Engineers Without Borders Canada, an organisation which uses emerging technology to improve lives in developing countries, when he undertook an internship in Malawi in 2008. This experience helped Duncan to realise the size and complexity of global issues such as safe water supply, and the focus of his work transitioned from purely technology to learning about systems thinking, service delivery models, governance and policy influence. Following completion of his undergraduate degree in 2010, Duncan returned to Malawi to work specifically on water and sanitation. He spent four years living in communities, working with district governments and eventually managing a team supporting the Government of Malawi to improve the management of water and sanitation service delivery across the country. Rather than directly implementing projects, Duncan and his team worked with permanent stakeholders such as government and the private sector, from local to federal level, to develop systems for monitoring and maintaining water and sanitation services. The experiences Duncan had in Malawi raised his curiosity as to how approaches to supporting systems change for managing service delivery might apply outside of that country. Many stakeholders influence how water and sanitation service delivery systems evolve over time, and he wanted to study the combined effects of government, private sector, civil society, international organisations and other stakeholders to understand dynamics which help services to improve. While exploring potential opportunities to undertake this research, Dr. Heather Cruickshank, a Lecturer and founding member of the Centre for Sustainable Development at the University of Cambridge, encouraged Duncan to apply for a PhD at Cambridge. Duncan says “I had never imagined doing a PhD, and certainly not at Cambridge, but from Dr. Cruickshank’s description it seemed like it might be the perfect opportunity. The research project I am undertaking is a dream come true for me, and a scholarship from the Cambridge Trust made it possible. The Cambridge community, including my college Hughes Hall, has made it possible to combine research around the world with ideas and critique from world class experts including my supervisor Dr Allan McRobie, and my advisor Dr. Jaideep Prabhu. Now in the final year of his PhD, Duncan’s field research has included case studies in six countries: Ghana, Malawi, India, Bangladesh, Tajikistan and Bolivia. Talking about these, Duncan commented “each country context is unique, and the diversity of these cultural and political environments provides an opportunity to produce findings which might have global applicability. Social network analysis is used to identify influences that help key stakeholders managing water service delivery to improve performance, in particular to identify how patterns of stakeholder interactions can solve problems to improve services across different contexts”. 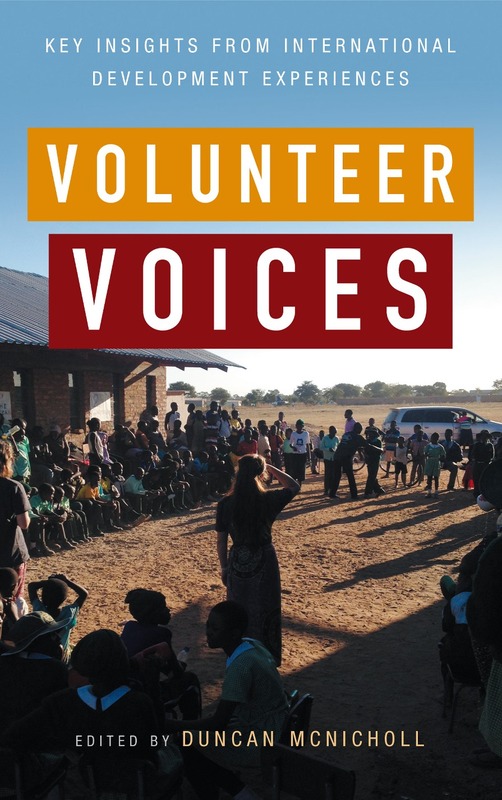 In addition to his studies, Duncan is the editor of a new book ‘Volunteer Voices’ which is aimed at international volunteers. Launched last month, the guide is designed to help aspiring young change-makers engage with the complicated environment of international volunteering. This collaborative project features over a dozen writers who share their stories in volunteering. By sharing those stories, which contain mistakes made as well as learning, the publication guides readers to reflect on their own work and ultimately improve their own practice. Duncan comments “personal growth is an essential part of becoming an effective participant, and the book encourages readers to reflect on their own work with honesty and humility”. ‘Volunteer Voices’ is available from Practical Action Publishing.